Our friends over at Franz have some exciting news. Your favorite free messaging integration platform is now offering a Hibox integration! Now you can manage all your different social and business messaging apps in one convenient place along with your Hibox account. Nowadays, mo st of us have multiple social and chat accounts we’re constantly jumping between- especially with work and social life. It’s getting difficult to keep track of! Franz is a one-stop, secure solution to this problem. 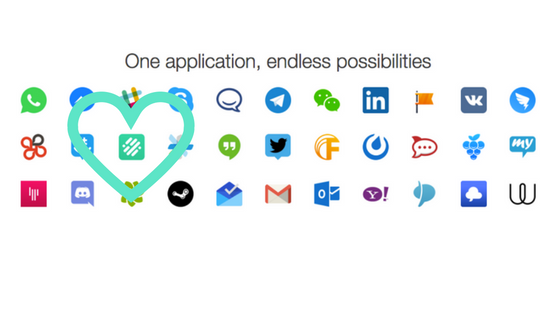 Franz allows you to sync all your communication applications together into one. You can add applications more than once to stay on top of multiple social and chat services easily with one screen. Franz makes having all your different messaging accounts up at once simple so you never have to log back in and out or use a million different windows again to stay in touch. You will now be able to link together your Hibox, Whatsapp, Skype, Facebook Messenger, and any many other tools and applications your team uses with Franz while having your personal accounts up as well. This is great for those of you freelancers working across multiple platforms with multiple teams as well as for people who want an easier way to manage their work and private communications! You no longer need to have multiple apps open and running to get notifications from all your groups. Franz organizes it for you. If you want to learn more about Franz, check out their site here or blog here.